If you solemnly swear that you are up to no good, and you happen to spend most of your time in Manhattan below the mid-90s, then you will appreciate this Raspberry Pi-based Manhattan Marauder’s Map. Not that a Harry Potter-themed map was necessarily [GawkyFuse]’s intention when creating this interesting build; it’s just that the old-time print of Manhattan — it shows Welfare Island in the East River, which was renamed Roosevelt Island in 1971 — lends a nice vintage feel to the build. Printed on plain paper, the map overlays a 64×32-LED matrix, which is driven by a matrix HAT riding atop the Pi 3. [GawkyFuse] uses the OwnTracks app on his and his wife’s iPhone to report their locations back to CloudMQTT. The Pi subscribes to the broker and updates his location in red and her location in blue as they move about the city; a romantic touch is showing a single purple dot when they’re together. There’s no word on what’s displayed when either leaves the map area, but the 2048-pixel display offers a lot of possibilities. We’ve seen a Weasley clock or two around these parts before, but strangely no Marauder’s Maps like this one. Although this Austrian tram-tracking map comes pretty close to [GawkyFuse]’s nice design. 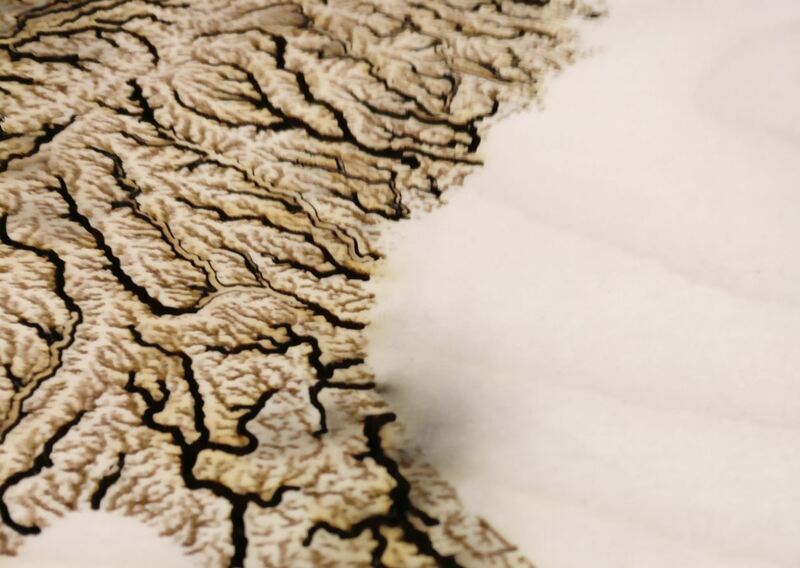 If you’ve ever visited Gettysburg, the turning point of the American Civil War, you’ve probably seen this illuminated topographical map. For years, it was housed in one of the many visitor centers in Gettysburg and demonstrated the progress of the 3-day battle with an amazing 1960s-era visualization using a 30 foot by 30 foot topographical map and many, many light bulbs. Even the coolest museum exhibits are eventually made obsolete, so this masterpiece of battlefield education is now up for sale. The starting price for this auction? Five dollars. We’re going to be honest. We talked about using Hackaday’s influence (and funding to buy toys such as an AR Drone and the Oculus Rift) to put a project together to save this gigantic map. It’s got everything we love in a large-scale project: giant things weighing several tons, cool representations of data, and vintage electronics. Really, restoring this map is the perfect project for any (very) ambitious hacker. It also helps I live a half hour away from Gettysburg. There’s a problem, though: the map is literally covered in asbestos. Also, it takes up four shipping containers and weighs 12 and a half tons. Basically, you’re bidding on a GSA auction to be responsible for a hazardous waste disposal project. Now that our dreams of doing something really cool with five dollars have come crashing down, we’re turning it over to Hackaday readers. If you run an asbestos disposal company and are around South Central PA or Maryland, there may be some people who want to get in touch with you. Drop a note in the comments. Really, we’d really just like someone to scan this 30-foot square map with a Kinect and a high-resolution camera, and maybe get our hands on a video of the hourly show when this map was still in operation. It should be possible to dig up some topographical data and replicate this map fairly easily… maybe someone should start a Kickstarter to build a smaller, non-asbestos laden copy? 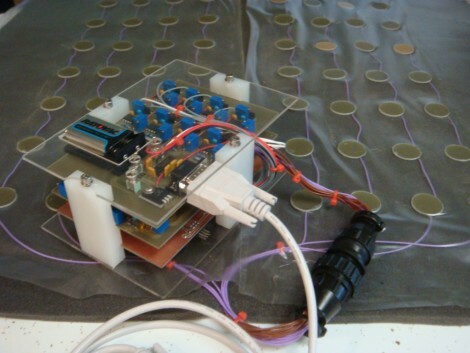 [imsolidstate] built his own pressure sensitive mat. It utilizes two discs of copper clad board with a piece of foam in between for each of 64 sensors. As the foam gets compressed, the capacitance between the two pieces of copper changes, a measurement that is fairly easy to make with an analog to digital converter. The mat is being used to measure how well a horse saddle fits the animal. Data is read in through a serial port and then mapped using Excel. This prototype proves that the concept works but [imsolidstate] mentions that there’s room to improve the sensitivity and that there could be more noise filtering incorporated into the design.